This wouldn't be such an occasion for celebration were it not for the fact that it has been gray and rainy since last Friday night. My hiking shoes and I will be heading out after work. Despite the gloomy weather, I haven't been cooking much over the past couple of weeks. Part of it is the casting process for On Golden Pond, which sadly remains ongoing as I seek out the last person, plus long hours at work, but part of it is that I've been wanting to eat basically two things: Mexican food and salad. There have been lots of blogs lately extolling the virtues of quinoa, a chewy little grain that takes on the flavors with which it's surrounded. I have nothing but love for it, especially since it's kosher for Passover (a huge discovery this year) and a complete protein. It's good hot or cold, and pairs particularly well with summery fish dishes. This salad would make a light main course or a perfect side--I served it with Nigella's mustard-coated salmon. 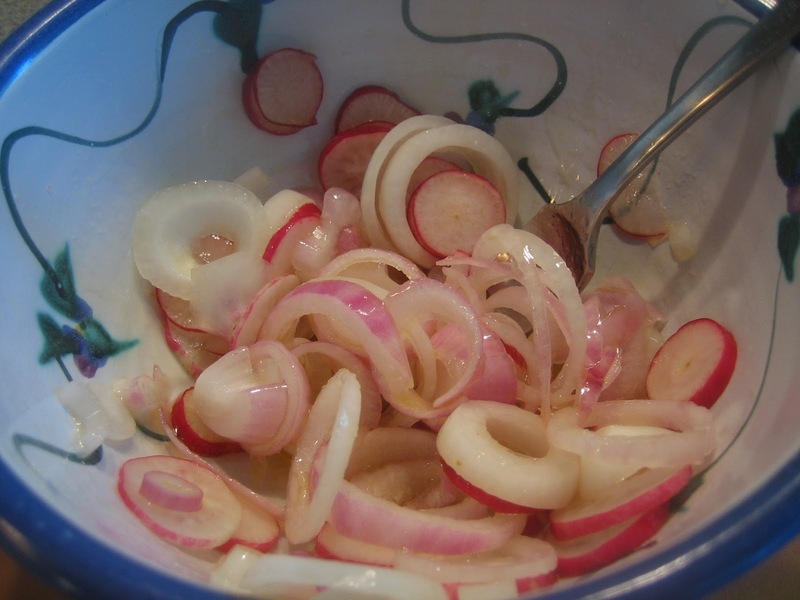 I've doctored it up to add some additional color and crunch from radishes. The ones we get in Alaska are vividly colored and very peppery, and I can't resist them. We ate this salad outside on a sunny night with a bottle of Italian white wine. Toast the quinoa in a large saucepan over medium heat, shaking or stirring it regularly until it crackles, about five minutes. Remove the quinoa from heat and rinse it in a sieve with cold water. Return the saucepan to the stove and heat the stock to a boil. Add the quinoa, bay leaves and salt, then reduce the heat. Cover the saucepan and simmer for about 15 minutes, stirring occasionally. Taste the quinoa to see how chewy it is and cook for an additional five minutes if it isn't soft enough. Remove the quinoa from the stove and allow to sit for an additional ten minutes. While it is cooling, whir the lemon juice, parsley and olive oil in a mini-prep food processor until the parsley is very fine. Pour this mixture into a small bowl and add the spring onions and radishes to marinate them. 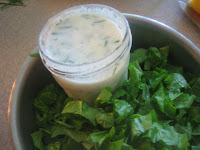 Then make the dressing: in a jelly jar with a lid, combine the lemon juice and salt and shake to combine. Let sit for a minute to dissolve the salt, then drizzle in the milk. Shake to combine, then add the chives and lemon zest. This will make more than enough dressing for this dish--you could halve the recipe if you don't want leftovers. Doesn't this look like the best brown-bag lunch? When ready to serve, toss the baby spinach with enough dressing to coat the leaves but not leave a lot of extra. Then combine the quinoa with the marinated vegetables. The original recipe calls for these two mixtures to be combined, but I left them separate--all the better to keep the spinach fresh for leftovers. Makes four main course servings, and would easily serve six as a side. How Lovely! sunny night with a bottle of wine! It looks so good. I love salmon. And quinoa:)which is my go to! Just the sound of mustard coated salmon and crunchy greens with peppery radish making me hungry and I am going for dinner. The radish definitely takes this one up a notch--plus it adds gorgeous color to the quinoa. This salad sounds wonderful. I haven't used quinoa all that much in fact only once but I love this recipe and would really like to make try it, and the spinach really makes it for me, too. I have some quinoa in the cupboard, this is perfect. Hope you are having a lovely week. Oh yes, this does look like the best brown bag lunch. It looks so healthy and complete!! I love quinoa, so shall try this for sure. 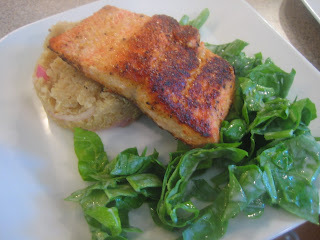 Salmons are our fav and with all those served together, lovely complete meal. I know how you feel, summer's finally here for us, 4th straight, sun shiny day! I am still on the fence when it comes to quinoa. I know we tried it quite a lot about a decade or so ago when we discovered that it was a complete protein but I guess I wasn't in love with it. Mind you, I wasn't adventurous with it either. Will have to give this a try, I think you've got some sharp and zingy flavours here that will definitely lift the quinoa! Will let you know what I think! Lin, I'm so glad you got some sun--and let me know what you think of the quinoa! Looks like we were both thinking salads today! This sounds just delicious, especially with that quinoa! I can definitely tolerate rain better than high heat. I hope it gets cooler soon! I'd eat that lunch any day! And I am new to quinoa, but I love it! When you talk quinoa I'm all over it. It's one of my go-to favorite grains. Delicious! This looks like lunch. For me. Tomorrow. Sounds like a great salad. I love grains and work with them a lot. Quinoa hasn't been one of my favorite grains, but it's definitely moving up the list--I love its chewiness. i always love to have salad in the morning, nice meal. Hoorah! We've had too much of it here but I'm glad you're able to enjoy it. Love your summery dishes (and yes...seems like the best brown bag lunch EVER)!!! now this is a delicious lunch! Quinoa is one of the most whole grains in terms of nutrition. It's so good and quite flexible. Delicious as a salad for dinner as you did or even as a breakfast dish if anyone has a gluten intolerance. Good recipe. I need to go get more quinoa! love the lemon zest in the dressing - it really brightens dishes, and I bet it was perfect with the fish. I still need to try quinoa at home! Hmmm this looks like a nice salad. And yes agree, you have the nice lunch!! :D I hope sun will stay out. Here it's going to be 80F weekend in SF. I can't wait for warm weather! This would be great for the dinner with a glass of chilled Chardonnay! Ooh, I didn't have Chardonnay with it...but that does sound perfect! Fast, easy and delicious! Not to mention packed with protein. Slam dunk! Good luck on that last casting! This is a beautiful salad! You made one perfect meal! I hope the sun will stay upon you for long! Such a fantastic meal! 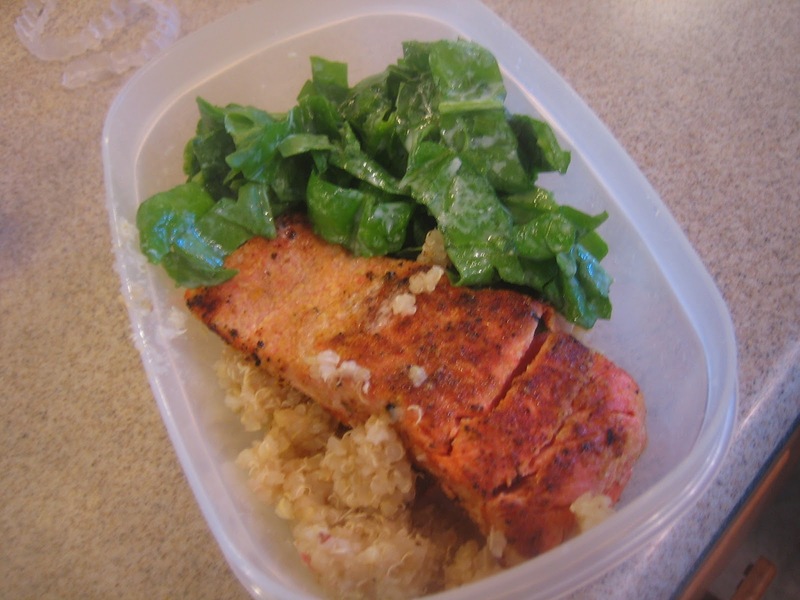 Love quinoa, love salmon and love spinach...and I'd be happy to mix all 3 together! Now that's a salad that would make for an exceptional meal! Love quinoa in salad!